Coping with a clay soil can be one of the most challenging aspects of gardening, particularly for beginners. But don't despair, I'd much rather have a clay soil than chalky or sandy, it's just a question of learning how to make the most of what you have got. Having a clay soil can seem very unfair. Like when you were at school, - you're going to do something new and the teacher brings out the equipment. But instead of paying attention, you were talking to your friend or daydreaming or had gone to the toilet. Then when there's the mad scramble for the stuff, you get left with every body else's rejects. You know it's going to be difficult, but most of all it just doesn't seem fair! However all is not lost, what you actually have is something very worthwhile indeed, it's just that you need to get to know it properly to get the most out of it. If you've got clay soil, then you're probably acutely aware of the fact, but if you're not sure, then take a little moist or wet soil in your fingers and rub it gently, If it "polishes" i.e. makes a shiny smooth coating on your fingers and is greyish brown in colour it's probably clay. The weather helps to break the soil up in the winter by the effect of rain and freeze / thaw on the clods that you dig up. Digging the soil over in the autumn and then leaving it rough for the weather to act upon is the most effective way of breaking it up. In the spring, the soil can be broken down much more easily into a fine tilth by raking. Organic matter is the way that you can improve the soil in the longer term. Garden compost, farmyard or stable manure and in large quantities, the bulkier the better. Dig it in if you can, but if there's just too much, then apply it as a thick layer of mulch in the autumn and then leave it for the worms to take down into the soil for you - slower, but effective. 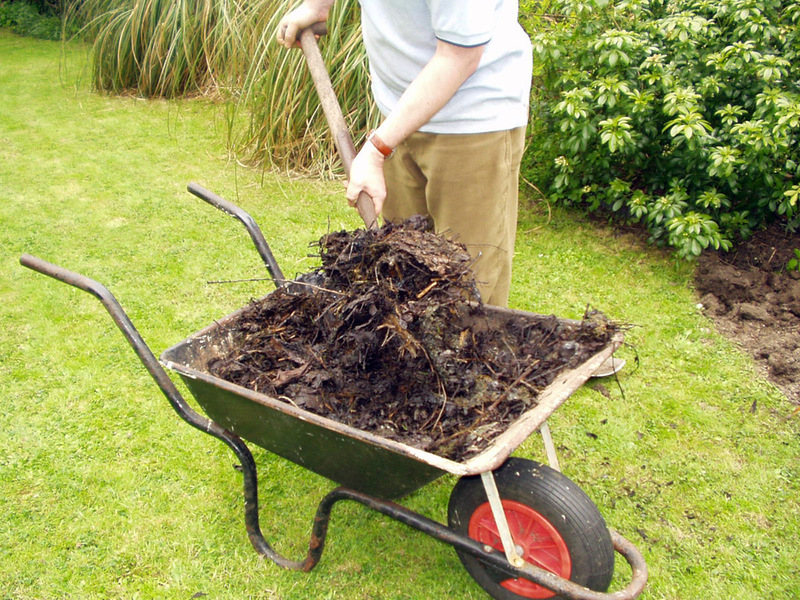 Also, whenever you do any work in the garden, you will work the organic matter into the soil as a side-effect. Time is the third key element. Really it means repeating the above two, for several years. It will take a few years, 3, 4 or even 10 of digging and adding bulky organic matter to really improve the soil for the long term. So keep going, things can only get better. If you have clay soil, never walk on it when it wet, you will compact it even more squashing out any pockets of air that it may contain and leaving it to develop a hard and caked surface when it dries out. Knowing when to dig or otherwise work the soil becomes a bit of a fine art in fact. Too wet and it's horribly sticky, too dry and it's horribly hard. I find a mattock (like a pick-axe, but with a large flat horizontal blade on one end) very useful if I have to work on a hard dry clay soil at the wrong time - digging holes, planting in winter for instance. Use a fork rather than a spade to dig the soil. Take more smaller bites with the fork, rather than trying to move too much soil in one go. Plants for clay - These are the most consistent performers. Roses, grow really well in clay soils, they have strong roots that get through it, the clay then provides plenty of nutrients a good anchor against wind rock and a ready supply of water that the rose roots can go and find. Phormiums, big grass-like plants with broad sword-like leaves from New-Zealand. Similar reasons to roses, the purple leaved varieties are not so tough however. Aucuba, Cuban laurel, yellow spotted green leaves, will grow in shady positions. Berberis especially darwinii and thunbergii. Versatile and varied group of shrubs, can be used for informal hedging, usually have spiky leaves or stems. Chaenomeles - Ornamental or Japanese quince. Masses of beautiful red to pale pink flowers depending on variety borne on bare stems when much of the rest of the garden is still dormant, yellow/orange quinces later on (quite flavourless though). Choisya ternata, Mexican orange blossom, Glossy evergreen shrubs that comes in two main types grown either for wonderfully fragrant white flowers in summer (and often again in autumn) with green leaves, or for vibrant yellow leaves in the variety "Sundance" which rarely flowers. Cornus varieties - Dogwoods One of the best shrubs for waterlogged areas for most gardens. Dogwoods are often grown for their winter stem colour which is red or yellow, grow as a coppice to maintain the colour. There are also varieties with attractive variegated leaves. Cotoneaster, a varied group of shrubs from small ground cover to tree like, white flowers, berries in autumn of various colours. Lonicera nitida, small leaved evergreen, good hedging plant. Mahonia, an evergreen shrub with holly-like leaves and fragrant yellow flowers from winter to spring, flowering time varies by variety. Vitis coignetiae - Crimson glory vine One of my favourite climbers, large bright green heavily textured leaves up to 12" across, fabulous autumn colours earn it its common name. Potatoes, the traditional crop to break up clay, they don't need a fine tilth, they can push their large strong roots and tubers through the soil and the act of earthing up helps break the soil up and suppress weeds. Plant main crop or late, don't bother with earlies as clay soils are slow to warm up in spring. Legumes, Runner / French / Broad beans, Peas. When the crop is over cut the plants off at soil level, leave the roots to die back in the ground so adding organic material and especially nitrogen from the root nodules that the plants form. Brassicas, cabbages, brussels, kale (not cauliflowers though). Main crop or late rather than early varieties as clay soils are slow to warm up in spring. Soft fruits, most types do well as long the soil is not waterlogged at any time. Fruit trees - Apples, Pears and Plums in particular. Root crops such as carrots and parsnips, they have difficulty in growing through the heavy soil and often end up with forked roots (unless you like the idea of growing "rude" carrots). Any kind of early crops including salads, unless the soil has been warmed in advance by using a cloche, cold-frame or plastic tunnel. Other plants that will generally do well in clay soil, though not as reliably as those above. Q. Builders have left me with bags and bags of sand. Can I improve the heavy clay of my garden with it? A. No, sand is not good for clay soil, when it dries out it can make it set like concrete, the particles are just too small and may actually hinder drainage you can use gravel to help drainage.